Spring approaches, and will be followed swiftly by the sweaty, sultry days of summer. Before you know it, you’ll be trading in your jeans for more revealing options all day, every day. 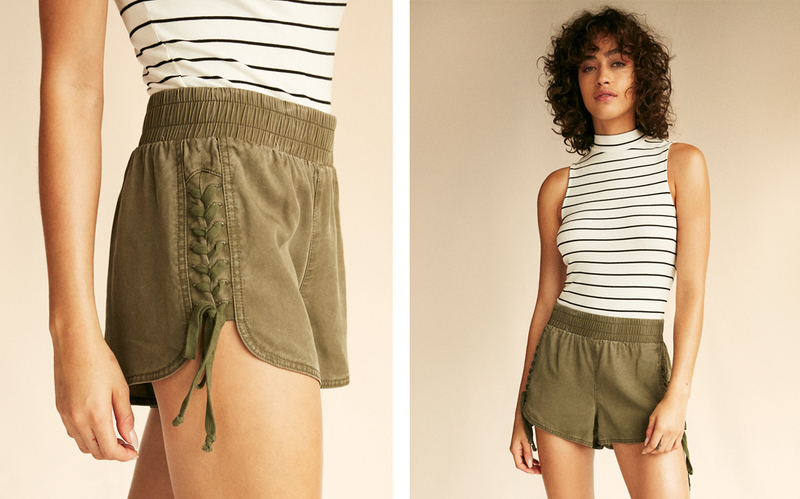 Enter: the small but mighty shorts. If you don’t already love them, there’s a chance you simply haven’t found the cut or style that makes you feel your most confident. The good news? Our design team spent countless hours making sure we had a range of options for you to choose from this season—no downside. And now, weeks ahead of the first heat wave, they’re all in stores. Here’s a look at six of the coolest pairs in our lineup and what shapes we think they’re great for. You know your body and style better than we do, so consider this a starting point rather than the final word on the matter. Cheers to warmer weather! If you’ve got the opposite challenge and want to make your frame look more curvaceous, our distressed denim cutoff shorts are a strong choice. A higher rise hugs the small of your waist, creating an hourglass silhouette, while fraying around the hem and slits up the front add some visual interest around your thighs. If most cutoff shorts tend to ride up a little too high on you, or you’ve got that pesky gap between your waistband and your bum, our higher rise, longer length shorts are a good choice. They have the same babe appeal as teeny tiny cutoffs, with just a little extra coverage where you need it most. If hiking up or pulling down a pair of shorts all day long sounds like your idea of, um, hell, try our utility short on for size. They sit high on the waist and have a tie waist, which helps them stay in place all day long. Throw on a blazer and—boom—you’re ready for a TED Talk. If getting swallowed up my too much fabric is a concern, these glam satin shorts are a fun option. They have a belt at the waist and a cuff at the hem which keeps everything clean and tidy, and they’re stretchy so they’ll skim your curves instead of looking too boxy. If you’re all muscle, you look great in shorts that are a bit more relaxed and fluid, but still quite short. Our military-inspired option is done in a slinky fabric that moves while you walk with a lace-up detail on the sides for a swingy finish.